This marks my seventh year of traveling to Kentucky to search for cask, but my new compatriot Andrew Whiteley has never experienced the wonders of the Bluegrass state so I decided to give him the Johnny Cash Tour, we are going everywhere. Our trip to started like many of the others, a late night arrival and a desperate search for food. It takes a minimum of 8 hours to travel from California to Kentucky, this time we met in Atlanta for the quick final leg. The mood was dower due to the Wildcats loss, but we couldn’t wait to hit the ground. Louisville has an exciting food scene, but the options are limited after midnight. Thanks to recommendation from a couple of locals on the plane, we ended up at The Hilltop Tavern. This grungy dive is just perfect and the kitchen is open late. In Louisville even the gnarliest dive bar typically has a good beer list and passable bar food. Apparently, the locals drink Underberg with a straw. I can attest to the fact that this method makes consumption of the herbal tonic dangerously easy. We didn’t hang too long as we had an extremely intense day of tasting to come, but getting into the late night Louisville vibe felt right. The Bourbon industry hopes to position itself as the new Napa and new direct flights from CA are going to do a lot to make that a reality not mention expand the post flight food options. Hilltop Tavern is a fine solution in the meantime. The following morning we hit the road early trying to get ahead of the undeniable over the top schedule I’d set out. For the first time in years we had a number of barrel tasting set up and in order to take full advantage of the opportunity we’d had 5-6 stops to make each day. 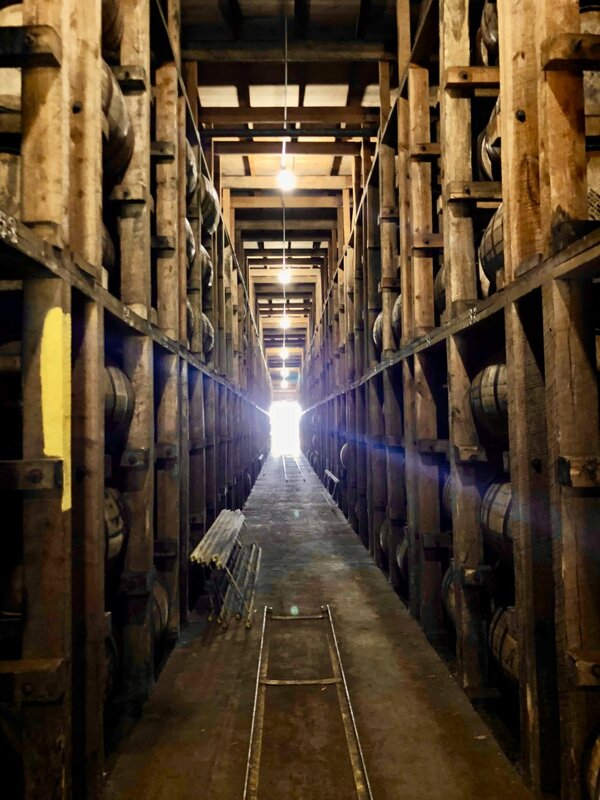 We headed south first through Bullitt County to the Four Roses Cox’s Creek facility. This is the domain of two of my absolute favorite people in the bourbon industry, Mandy Vance and Al Young. We arrived a bit early and toured the small facility where all the world’s Four Roses is blended and bottled. Of course they were dumping some ridiculously old barrels of whisky into their “5-year-old” Yellow Label product. Arguably the best value bourbon on the market, this 12-year-old bourbon being used in this batch is exactly why. When we got back to the barrel tasting room, ten barrels were lined up with their details hidden from us. We theft’d some samples and began the tasting. The only information that we were given was that one of the barrels was 11 years old and another was the ever rarer OBSK recipe. We waxed into the samples with relish. The easiest tactic in these sorts of semi-pressure tasting situation is to find concensus by elimination. We taste through the samples 3 or 4 times and then begin to reject certain casks. There’s typically easy consensus on the first 2 or 3 although this time Andrew and myself actually differed from Al’s conclusions. Al explained that he often tastes for with a bias for bourbons that exhibit the characteristics of their particular recipe. The K&L team just had to determine which five of these ten barrels were objectively more delicious. With three of the ten eliminated in a matter of minutes tans, the elimination round organically morphed into a conversation about which we had to keep and why. Ultimately the last 6 casks all had excellent potential so we decided to pull the blinders off and see what we’d been looking at. Shocking the barrel that both of us had immediately rejected was the 11 year old. We shouldn’t have been surprised, but the salesperson in me just about screamed since these older barrels are so easy to sell. But the whiskey just wasn’t good, filled with astringency and an odd floral quality, so we chose not to reverse ourselves in the name of profit. 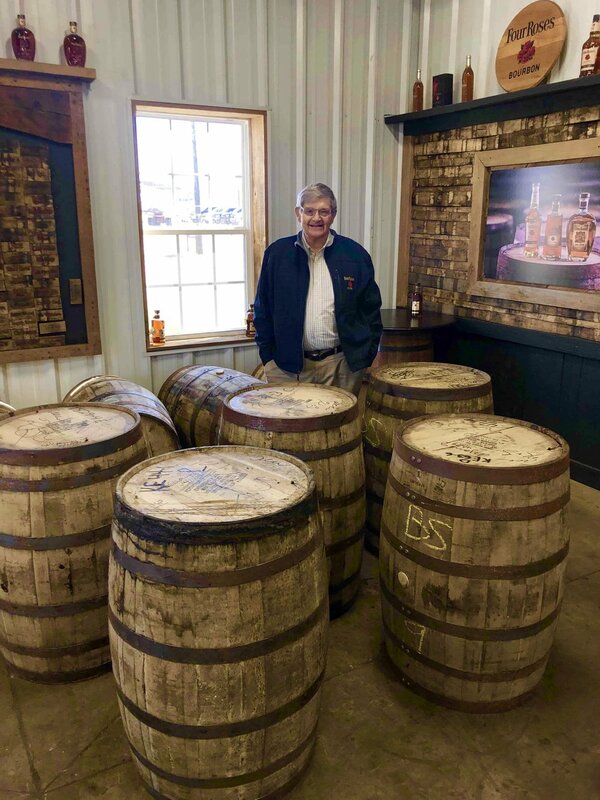 What we did bit are 5 delicious barrels that show the incredible diversity and quality that Four Roses is renowned for. We selected a young spicy OBSK and its older rounder cousin 10 year old OESK. We grab two 10 year old V strains from each mashbill and a fabulously approachable OESF at 10 years old that shows all the gorgeous mint and fruit that strain is known for. After the tasting, Al took us up to the warehouse for a little chat and a detailed examination of their unusual aging system. He’s not only one of the most knowledgeable people left in KY but also one of the most open. He dove into some of the historically significant aspects of the distilleries history and explained the circumstances that led to this special bourbon not being available on the US market for decades. Thankfully when the current owners Kirin took over they committed to restoring this special brand to its former glory. And glorious it is. We headed out from Cox’s Creek confident that this would be one of the most successful trips to Kentucky we’d ever enjoyed. We really had no idea how special the path ahead would be, but Bardstown was beckoning and we were ready to follow the call.